Before this test, when I thought Maxi, the words that came to mind were ‘traditional’, ‘sturdy’ and ‘homely’, but the new Pelle Petterson-designed Maxi 1200 is anything but. The Maxi 1200 is the second model to be produced from the Delphia yard and is aiming to take this trusted brand in a new direction. For the first time Petterson has teamed up with Tony Castro to design the interior and the results have been heralded as a breath of new life to the Maxi brand. Founded by two Polish brothers in 1990, Delphia Yachts is now the third largest yacht manufacturer in Europe. It has a workforce of around 600, one of the biggest CNC machines on the continent and already produces an impressive array of sailing and motorboats, handling everything in-house. But despite the success of the yard there still seemed to be a certain something missing from its sailing boat range, something that would appeal to serious European cruisers and it looked towards the Scandinavians for the answer. In 2012 Delphia bought the Maxi brand, and with it a whole Swedish package of heritage, quality and reputation which it hopes will do the trick. 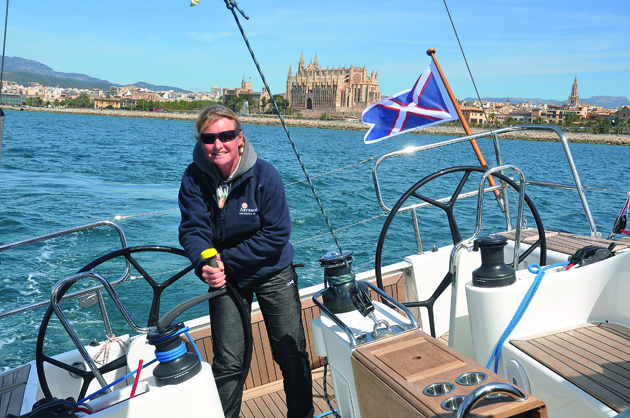 I flew out to Palma to test sail the Maxi 1200 and find out whether it had what it takes to seduce the toughest of sailors. 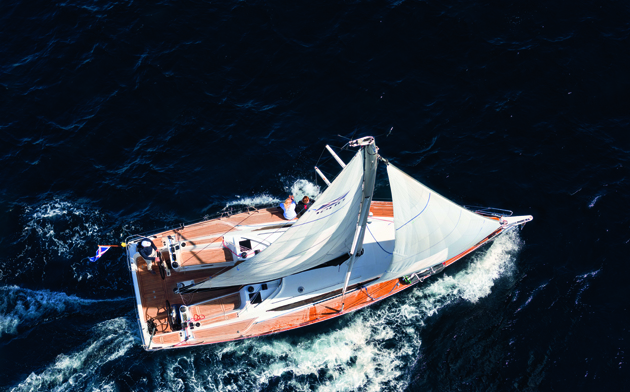 At the grand age of 82, Olympic and America’s Cup veteran Pelle Petterson designed this boat to be sailed easily by one person – not necessarily single-handed, but to be a pleasant experience for someone to be alone on deck. 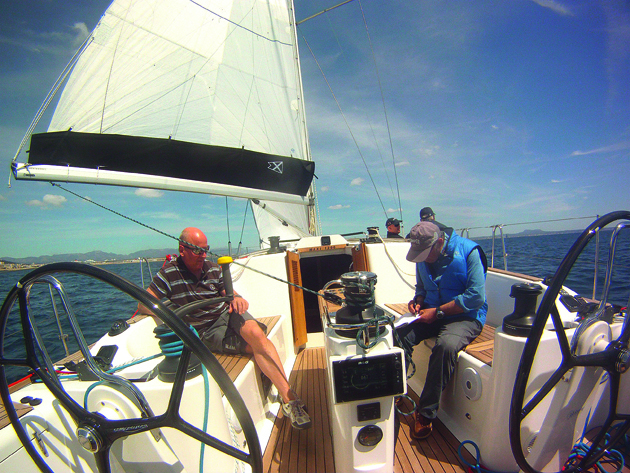 This philosophy of easy, hassle-free sailing is a continuous theme running through every aspect of the boat, exemplified by the ergonomic layout of controls at the after end of the cockpit, where a triangle of waist-high winches set on pedestals in easy reach of both helming positions is more reminiscent of a Class 40 cockpit than a cruising boat. To keep the decks clutter-free, all lines appear from underneath covers, lead to their respective winches and then snake out of sight into generous-sized and well-sited lockers, keeping mess out of the bottom of the cockpit and the decks safer for crew. Of particular note was the arrangement for the jib sheets and jib car control lines, which are both led back to the primary winches beneath a raised step in the teak deck (teak comes as standard), providing both a raised position for crew to sit out and a way to divert water rushing down the deck away from the cockpit. It felt natural and easy for me to handle the boat alone upwind. I could perch on the windward side with the carbon wheel in one hand and electric mainsheet winch controls exactly under the fingers of my other hand. To trim the genoa, I simply stood up, dropped down to the leeward wheel, using well placed grab handles, and was then standing at the winch to wind in or ease out. Standing up to trim on primary winches is a revelation; it is kind to the knees and back, and this Maxi 1200 offers multiple places to brace yourself and work. I rather hogged the wheel on our test sail and, of course, took the opportunity to tack, gybe and trim sails single-handed, which seemed so easy compared with scrabbling around the raceboats I am used to. I felt I was gliding around the back of the boat. Upwind we made good speed with a light helm; in 12 knots TWS we averaged around 6.8 knots of boat speed at a TWA of around 50°. Doubtless a lower true wind angle beating could be achieved using in-haulers on the headsail, as the jib cars are sited on the deck rather than the coachroof and therefore make quite a wide base. 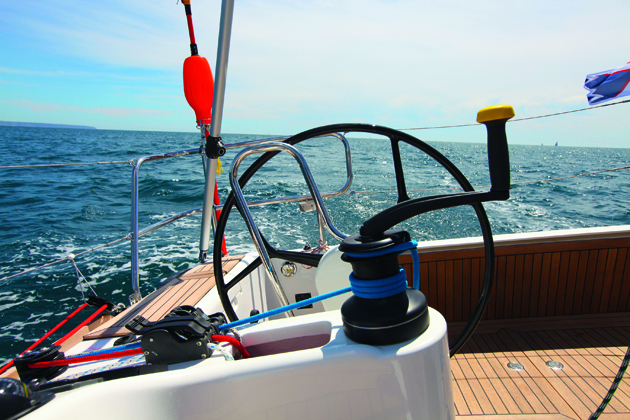 However, I guess this comes down to your own sailing philosophy – easy miles or squeezing every ounce from your boat. Adding in-haulers would certainly disrupt the clean and calm exterior of this boat. Standing up to helm upwind, I felt a little precarious with only one foot chock on the high side and almost the full 3.75m of beam below me. But when I mentioned this to my hosts from Delphia Yachts, co-founder Wojciech Kot and his neice Ewa, they announced they already have plans to put another two foot chocks in later boats. Steering from the leeward side is comfortable and allows a fantastic view of the jib telltales; however when heeled well over I had absolutely no idea what might be approaching to windward. The mainsheet arrangement is perhaps the boldest statement of the Maxi’s simple sailing philosophy and definitely a step away from the traditional set-up. The mainsheet comes straight down to a central, reversible, electric winch on a pedestal in the centre of the cockpit, at the end of the cockpit table. There is no traveller and the mainsheet itself is a single line, led directly to the winch. I must admit I was surprised by this arrangement – without a traveller how can you trim the main properly upwind? Can an electric winch really dump a mainsheet quickly? But actually the more I played around with the system, the better I accepted the compromise in the interest of simplicity. 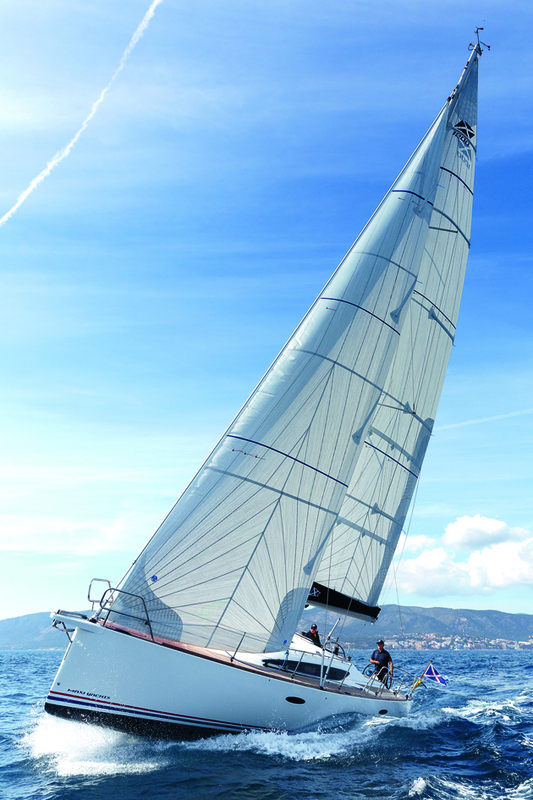 In reality, when a traveller is set over the top of a coachroof – perhaps as much as halfway back from the end of the boom – how much greater effect does it have in controlling mainsail leech tension than the kicker and how effective is it at bringing the end of the boom onto the centreline? I know on many boats with these arrangements the traveller is often too heavy to trim easily or is even seized up from lack of use. The decision to do away with a traveller seems a bold one, however. What the Maxi offers as an alternative is a mainsheet at the end of the boom for maximum effect, with an electric winch that comes as standard and has enough power to pull the leech down as hard as you need. The reverse function on the electric winch allows you to spill wind responsively and the winch itself is not far away from the helm so if a bigger ‘dump’ is required, it is well within reach. The downsides of this system are all about lack of choice when trimming the main. 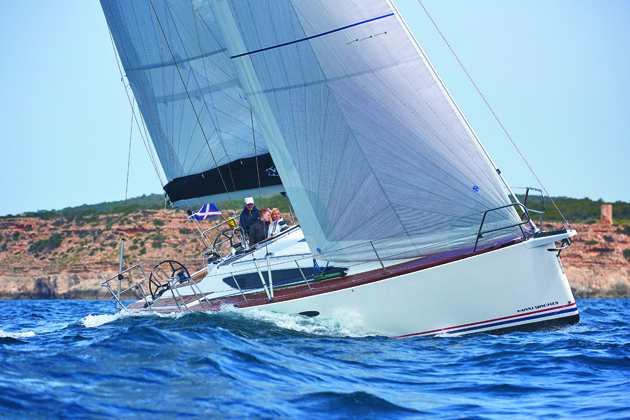 Upwind the boom will never really be on the centreline and any deviation to fetching will result in easing the mainsheet rather than a traveller and so give a bit more twist in the mainsail than you might have chosen. But as with my observation on in-haulers, it depends on your philosophy as to whether this would bother you or not. The only note of caution is that with the winch being placed up at waist level, when reaching or running, the mainsheet crosses the cockpit at an unusually high level, which might take crew standing in the cockpit by surprise when gybing. Off the breeze we tried both white sails and a gennaker. Under gennaker, reaching at angles from 110°-130° TWA, the Maxi 1200 achieved speeds up to 9 knots, with no pressure on the helm and was a joy to sail. With the wind further behind us I was able to trim the gennaker from the primary winches while standing at the helm. I did not feel as if I was dragging too much extra weight around during the lulls. The boat seemed keen to make a reasonable speed in as little as 6 knots of wind.